I just checked a few of my former lenses, and it seems like 301 redirects from Squidoo don't work anymore. Does anyone know anything about this? I used to have some social media traffic, mostly from Pinterest and Google+. That traffic is lost now. Not all of the content on Squidoo was transferred, so it is possible that much of your Squidoo content will not redirect to HubPages. Thanks for replying. All my former lenses transferred to HP. I checked for a few hubs that I am sure were transferred. It is probably widespread. It started with the profile page which disappeared first. Initially I thought it was on purpose, although I can't see any reason for that. At the time the lenses were still redirecting. Now, the redirect doesn't work for lenses either. Can you share a URL for a Squidoo featured lens that you believe should be forwarding to HubPages Hubs that met the criteria to be transferred? Lenses formerly linked to in other pages are now not redirecting and show up as broken links. These are pages that were transferred and featured originally, not lenses that were WIP. 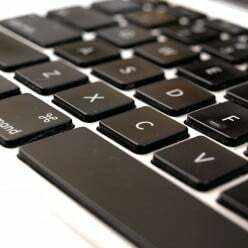 It means manually going in to pages here and putting in the new link to eliminate the exclamation mark. It is more of a problem with pinterest and other links. It makes me glad I didn't have that much time for linking pages together or pinning. They seem to be working fine for me. Actually, Matthew, very recently lots of redirects from the Squidoo site appear to have stopped working. The disappeared redirects were from URLs that predate any use of subdomains. I'm showing this effect consistently across multiple transferred accounts. People who joined Squidoo later, after category subdomains and user subdomains were in effect, would be immune to this effect. But any content of mine which was first published under the main Squidoo domain appears to have lost its first Squidoo redirect this week. I've forwarded this info to our engineering team. Can you provide any URLs that you believe should be redirecting but are not? This Hub, along with all others of mine (across two Hub accounts) that were originally published as top-level Squidoo domain lenses, all saw the redirects from those specific original URLs go away this week. @relache. Both of those URLs appear to be forwarding now. Any other examples to check? Yes, there are other examples. As stated twice before in this thread, I am seeing that *every* Squidoo lens that I had which was originally published on Squidoo's top level domain lost its redirect this week. Would you like me to list the several dozen URLs I have found at the present, or wait until I have finished manually checking the approx two hundred Hubs that got imported and which are still published? So far, we have had no examples provided that are not forwarding correctly. If you can provide some that are not, I can pass that info to our engineers to see if we can track down the potential issue. Right now, when I click on http://www.squidoo.com/fairywings/ it does not redirect to the Hub, it redirects to a generic "the page you requested is gone" message, but for a little while yesterday after you initially told me it was fixed it was actually redirecting to the moved content, which can be found at http://schwarz.hubpages.com/fairywings-2 However that is no longer the case. That fairy wing Hub content was born at that initial URL, and lived the best, most-productive years of it's life at that URL. Once Google introduced Panda, Squidoo moved it around. It lived at http://relache.squidoo.com/fairywings and it also lived at http://crafts.squidoo.com/fairywings and HubPages seems to know that, and both of those URLs are being redirected to the Schwarz subdomain appropriately, but the redirect from the original URL is not working anymore. And I have a similar scenario for dozens of other Hubs. That's a broken redirect to me. What is it to you guys? If you remove the trailing slash, then this one works and forwards. I also sent a feature request to our engineering team to consider adding support for the trailing slash. I support your request to add support for the trailing slash, especially as it was something that appears to have gotten added during importation. At no point would I have been doing that manually. In the meantime, I suppose I now have to reconsider yet another fix-it pass for several hundred pages. We just deployed a change so the trailing slash addresses should now work. Thanks so much for looking into this Matthew. 301 redirects still seem to be working (except on individual lensmaster profiles). If your Pinterest pins are linked to the incorrect URLs, simply delete the "/lensmasters/dbodnariuc/" part and it should work. All my pins from Squidoo are pointing to my HubPages hubs. Oops, used the wrong addresses. Thanks for pointing that out neosurk. I have to dig through my Pinterest pins, it was two lenses in there which drew my attention. Are these hubs unfeatured because they lose the 301 then. Quite a few of mine suddenly went unfeatured due to lack of engagement. For info, they've said on other threads that they didn't put a redirect on profile pages. There was one in the first two weeks or so. I am pretty sure. Yes, this is a growing problem. 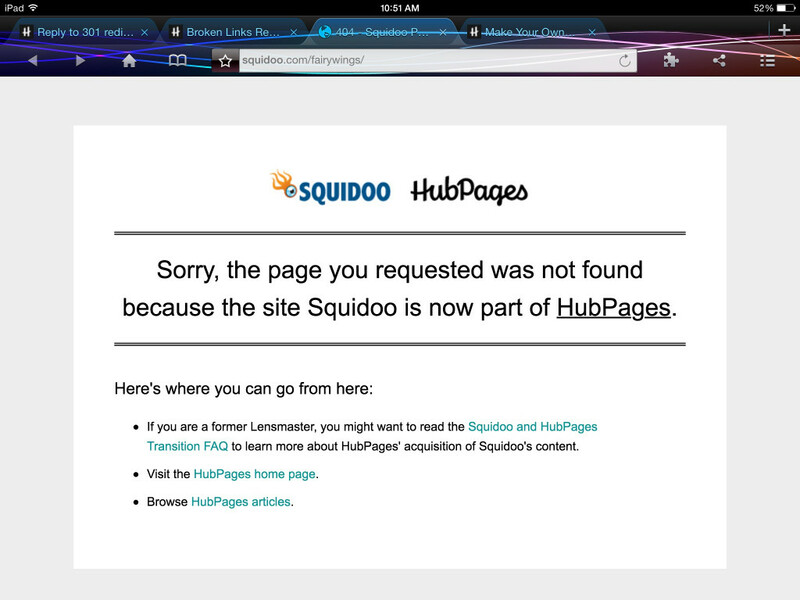 Each time I click on a link to a Squidoo lens--mine or others'--I get a 404 message that tells me to go to HubPages and do a search. ALL of my lenses were in the top 150,000 at Squidoo when the merger was announced, and many were much lower than that, in the top 50,000. All of my lenses transferred without a hitch, yet every time I run across a link to one of my lenses-now-hubs and click on it, I get the 404 error message, not a re-direct. This, along with the unimaginable drop in traffic and the ongoing problems with stats make me much less optimistic about a future for my work on HubPages. Mine were working earlier this week. After reading this I tried some searches again My redirects are no longer working either. I have been having these unfeaturing and redirect problems for weeks now. One day I'll have 12 hubs unfeatured and the next day they are all fine only to be unfeatured again the next day. One day about a month ago, half of my hubs had broken links where I had linked my pictures to my squidoo profile page so I fixed them all by taking the links out but oddly enough, there's still some of those links on other hubs that are redirecting correctly. None of those with the broken links had been unfeatured hubs so it had nothing to do with that. My stats have been the same for the past week now and I just don't know enough to do anything about any of it. I'm trying to be patient but every day it seems something new is broken. My redirects don't work any more, either. I get a 404 error message that tells me the page is now part of HubPages, but that's it. All of my pages transferred easily and redirects had been working. I have no idea when they stopped working. Mine aren't working either. I've checked on my other sites like Pinterest and the links don't work. For some I've changed the links to HP, but there are too many to find them all. Does this mean the article isn't featured even though it says it is? I'm not sure about mine, but that would explain a lack of traffic on some of them. However, I have noticed that Google has already re-indexed many of my former Squidoo pages as Hubpages. When I look on my pins on Pinterest, they have also changed to Hubpages, too. I just found a page full of links to my older lenses and they're redirecting fine, it looks like. Mine are all working now. Pins on Pinterest even detect that the destination is a HP hub. Hey great. Are they all fixed now? If so, it is a miracle. Happy Thanksgiving.